AOSP includes test templates for test modules that are not host-side Python subclass of VTS runner's BaseTest. Figure 1. 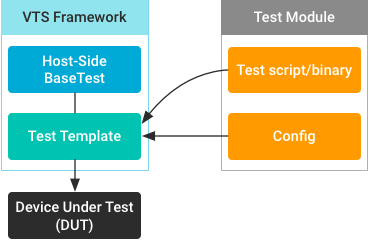 Test template architecture. Developers can use these templates to minimize the effort involved in integrating such tests. This section covers configuring and using the test templates (located in the VTS testcases/template directory) and provides examples for commonly used templates. These tests can be integrated into VTS with or without the BinaryTest template. binary-test-source and binary-test-type are template-specific. Specifying the test binary source's relative host path enables the template to handle preparation, file pushing, test execution, result parsing, and cleanup. The template contains test case creation-related methods for subclasses to override. The template assumes one test case per test binary module, and the binary source file name is used as test case name by default. binary-test-source strings Binary test source paths relative to vts test-case directory on host. binary-test-working-directory strings Working directories (device-side path). binary-test-envp strings Environment variables for binary. binary-test-args strings Test arguments or flags. binary-test-ld-library-path strings LD_LIBRARY_PATH environment variable. binary-test-type string Template type. Other template types extend from this template, but you don't have to specify this option for this template because you already specified binary-test-source. For options with value type strings, you can add multiple values by repeating the options in the configuration. For example, set binary-test-source twice (as shown in the VtsDeviceTreeEarlyMountTest example). You can add test tags by prefixing them to options with strings values and using :: as the delimiter. Test tags are especially useful when including binary sources with the same name but with different bitness or parent directories. For example, to avoid file push or result name collision for sources with the same name but from different source directories, you can specify different tags for these sources. As shown in the VtsDeviceTreeEarlyMountTest example with the two dt_early_mount_test sources, the test tags are the _32bit:: and _64bit:: prefixes on binary-test-source. Tags ending with 32bit or 64bit automatically mark the tests as available to one ABI bitness; i.e. tests with the tag _32bit are not executed on 64-bit ABI. Not specifying a tag is equal to using a tag with an empty string. Options with the same tags are grouped and isolated from other tags. For example, binary-test-args with the _32bit tag is applied only to binary-test-source with the same tag and executed in binary-test-working-directory with the same tag. The binary-test-working-directory option is optional for binary tests, allowing you to specify a single working directory for a tag. When the binary-test-working-directory option is left unspecified, default directories are used for each tag. The tag name is directly appended to test case name in the result report. For example, test case testcase1 with tag _32bit appears as testcase1_32bit in the result report. In VTS, the default test format is host-side Python tests extended from BaseTest in VTS runner. To integrate target-side tests, you must first push the test files to device, execute the tests using shell commands, then parse the results using host-side Python scripts. Determines the absolute source file path. Pushes the files using adb push command. Deletes the files after tests complete. Alternatively, you can push files manually using a host-side Python test script that follows a similar procedure. The GtestBinaryTest template hosts GTest test binaries, each of which usually contains multiple test cases. This template extends the BinaryTest template by overriding setup, test case creation, and result parsing methods, so all BinaryTest configurations are inherited. binary-test-type string Template type. Uses the value gtest. In general, setting gtest-batch-mode to true increases performance while decreasing reliability slightly. In VTS compliance tests, many modules use batch mode to improve performance. For reliability however, if the mode is unspecified it defaults to non-batch. Non-batch mode makes individual calls to GTest binary for each test case. For example, if the GTest binary contains 10 test cases (after filtering by host side configuration), the binary is called 10 times on device shell each time with a different test filter. For each test case, a unique GTest result output XML is generated and parsed by the template. Test case isolation. A crash or hang in one test case does not affect other test cases. Granularity. Easier to get per-test-case profiling/coverage measurement, systrace, bugreport, logcat, etc. Test results and logs are retrieved immediately after each test case finishes. Redundant loading. Each time GTest binary is called, it loads related libraries and performs initial class setups. Communication overhead. After a test completes, the host and target device communicate for result parsing and next commands (future optimizations possible). In GTest batch mode, the test binary is called only once with a long test filter value containing all test cases filtered by host-side configuration (this avoids the redundant loading issue in non-batch mode). You can parse test results for GTest using output.xml or using terminal output. Figure 3. Batch mode, output.xml. As in non-batch mode, the test result is parsed through GTest output xml file. However, because the output xml is generated after all tests are completed, if a test case crashed the binary or device no result xml file is generated. Figure 4. Batch mode, terminal output. While GTest is running, it prints the test log and progress to the terminal in a format that can be parsed by the framework for test status, results, and logs. Test case isolation. Provides the same level of test case isolation as non-batch mode if the framework restarts the binary/device after a crash with a reduced test filter (excluding finished and crashed test cases). Granularity. Provides the same test-case granularity as non-batch mode. Maintenance cost. If the GTest logging format changes, all tests will break. Confusion. A test case can print something similar to GTest progress format, which can confuse the format. Because of these disadvantages, we have temporarily removed the option to use command line output. We will revisit this option in the future to improve the reliability of this function. HostBinaryTest does not extend the BinaryTest template but does use similar test configurations. In the above example, the binary-test-source option specifies a host-side relative path to the test executable, and binary-test-type is host_binary_test. Similar to BinaryTest template, the binary filename is used as the test case name by default. Figure 5. Extending existing templates in the VTS repo. Special test setup procedures, such as preparing a device with special commands. Generating different test cases and test names. Parsing results by reading command output or using other conditions. To make it easier to extend existing templates, the templates contain methods specialized for each functionality. If you have improved designs for existing templates, we encourage you to contribute to the VTS code base.